I have a long history of snubbing recipes that require me to roast vegetables. Roasting veggies takes too long, has always been my thinking. Call me lazy, but there was just something about setting aside the time to chop the vegetables, season them and then allow for oven time before I could use them in my recipe, that completely turned me off. But last week I discovered how easy and worthwhile roasting veggies can be. I'm still thinking about the wonderful aroma in my apartment while my zucchini and eggplant chunks were in the oven — incentive enough to give today's simple, tasty pasta recipe a try. This is one of those "sneaky vegan" dishes I mentioned in an earlier post. The Daiya is what makes it pure veg as opposed to lacto ovo, and you would never know the difference. 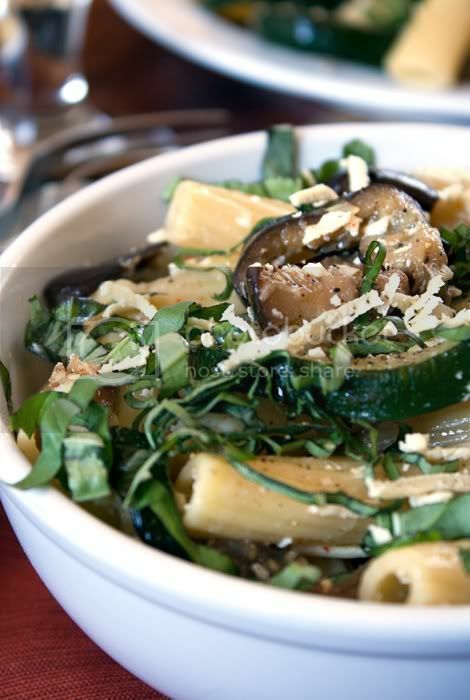 But if you're not ready to go 100% vegan, simply substitute in grated Pecorino Romano cheese. To start: Preheat the oven to 400°F. 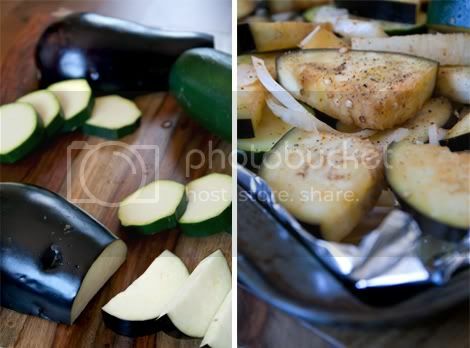 Prepare the vegetables: Toss zucchini, garlic, onion, 2 1/2 tablespoons oil, and cayenne in a bowl. Spread mixture on a large rimmed baking sheet; sprinkle with salt and pepper. Roast vegetables until tender, turning occasionally with a spatula, 30 to 35 minutes. Prepare the pasta dish: Return the cooked and drained pasta to cooking pot. Toss with 1/2 tablespoon oil. 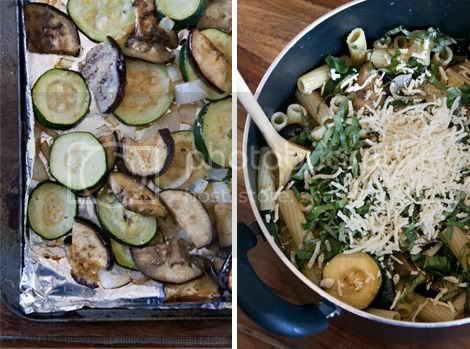 Add roasted vegetables, 1/8 cup pasta cooking water, and 1 tablespoon oil; stir over medium heat until heated through. Add the basil, reserving about a quarter of it for garnish, and the Daiya. Toss, adding reserved pasta water by tablespoonfuls to to moisten if dry. Season with salt and pepper. Transfer to a large platter. Sprinkle pasta with remaining basil. Serve immediately.